With mostly dry weather prevailing over Tamil Nadu except for some isolated thunderstorms in the interior places. This has resulted in a slightly warm afternoon setting across the region. Yesterday saw Salem & Vellore cross 38 degrees for the day after a gap of more than a week under more clearer skies. While summer is still not upon us yet but the day time temperatures are likely to stay close to normal or slightly above normal in some of the places. There is some solace though as thanks to the presence of trough at 0.9 kms above sea level that stretches all the way from Bihar to North Tamil Nadu we are likely to see a strong burst of Easterlies later in the day. After the early morning Westerlies thanks to the temperature gradient prevailing between land and see we are likely to see very strong surface level Easterlies around late afternoon that is likely to keep the temperatures in check. 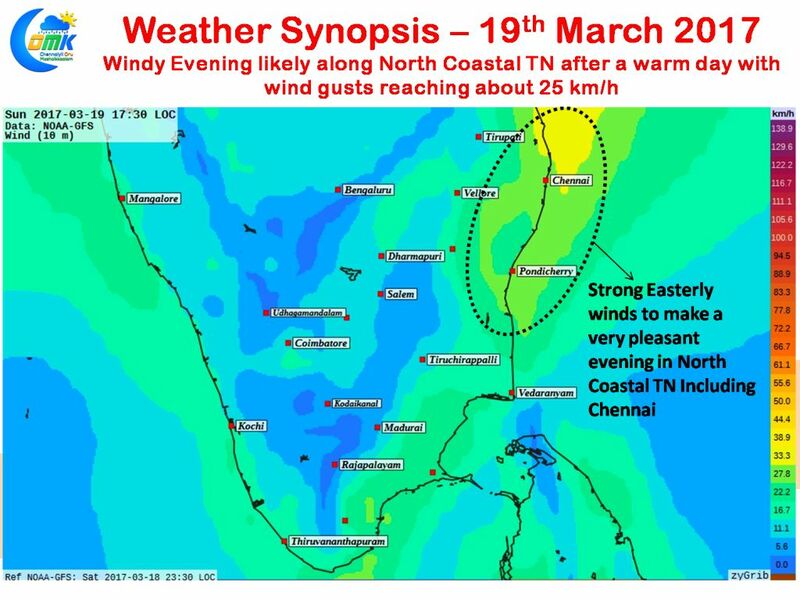 Chennai and the surrounding places of North Coastal Tamil Nadu could see surface gusts of up to 25 km/h at times in the evening making it very pleasant. The trough is likely to provide for some isolated thunderstorms along Andhra Pradesh and one or two places in Tamil Nadu as well but overall fairly dry conditions are likely to prevail over most parts of Peninsular India except for extreme Southern areas of Kerala & TN.